Getting interviews but no offers? Get valuable feedback through a mock job interview. Build your value, learn how to leverage your strengths, mitigate your weaknesses, answer those behavioral based interview questions, and negotiate your salary with confidence. 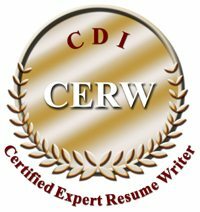 Or if your recent work history is a little unstable, we can provide customized interview coaching and help you ace those questions. Job search is rough and interviewing is stressful. 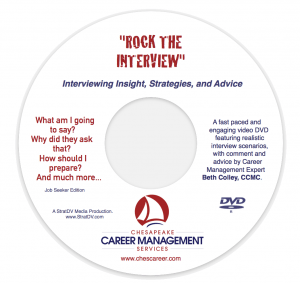 Prepare yourself with our Rock the Interview DVD! Along with a hilarious 10-minute video of what not to do in an interview, Rock the Interview provides the perfect answers to the five most commonly asked job interview questions. Wondering how to talk about your strengths and weaknesses? Need advice on addressing the salary question? Do you know how to respond to that dreaded “Tell me about yourself” question? What about dealing with those behavioral based interviews? Our DVD answers those questions and will calm your worst interview fears. Order your copy ofRock the Interview today for $53.95 (includes shipping). To order, email Beth and include your name, address, and email and telephone contact information. Beth will contact you to arrange for payment and shipping.